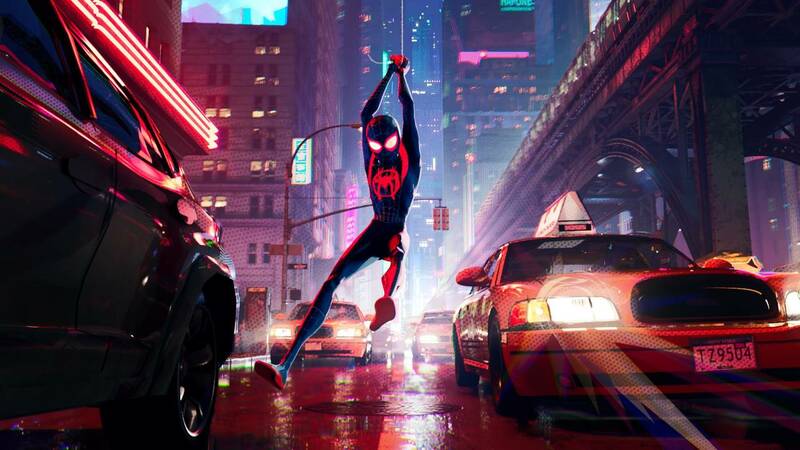 (CNN) - Much like its hero, "Spider-Man: Into the Spider-Verse" swings wildly from place to place, in a tone that's so uneven as to initially be a trifle disorienting. Stick with it, though, and this animated feature -- distinguished by its dazzling visual palette, which creates the feel of a comic book leaping onto the screen -- proves a great deal of fun, reinforcing that animation remains the ideal medium (if not the most profitable) for superhero adaptations. Produced by, among others, the makers of "The Lego Movie," this "Spider-Man" is filled with an even higher level of irreverence, mirroring some of the cheekiness that has defined the "Deadpool" movies. That sort of relentlessly smart-alecky tone can become a bit wearisome, and the convoluted plot might have even comic-book nerds scratching their heads, built as it is on the notion of multiple permutations of the signature Marvel hero being sucked into the same universe. It seems the Kingpin (voiced by Liev Schreiber) is seeking to open portals to alternate realities, in the process bringing an assortment of Spider-People into the same colorful, chaotic realm. Central among them is Miles Morales (Shameik Moore), a teenager who is (yes) bitten by a radioactive spider, endowing him with spectacular abilities. He's ill equipped, however, to deal with this world-shattering threat, receiving counsel from the original Spider-Man, Peter Parker (Jake Johnson), who, in his world, is paunchy and older, having messed up his life and relationships. Filled with insider references and visual flourishes aimed squarely at the comics faithful -- from thought balloons to approximating the Ben-Day dots from old-fashioned printing -- the movie caters to a very particular crowd. The filmmakers also play it heavily for laughs, especially in the learn-by-doing stage of Miles' origin story -- coming to grips with the whole "With great power comes great responsibility" thing -- in a way that skews more toward older fans than kids or casual ones. The one constant, which redeems most everything else, hinges on the swooping nature of the visuals, which explode with energy as Spider-Man swings, fights and occasionally careens across a skyscraper-filled New York. Even if the chaotic finale drags on a bit, the movie also serves as a loving ode to the comics -- including a tribute to Spider-Man creators Stan Lee and Steve Ditko -- that capitalizes on the attributes (and lower budgets) of animation to tell a story that indulges in the kind of quirkiness and eccentricity that would derail a live-action blockbuster. The film, notably, comes on the heels of Sony and Marvel's collaboration on the live-action "Venom," and it surpasses that by leaps and bounds. Sony has already announced plans for a sequel and spinoffs, appearing determined to mine the nascent Spider-Verse for all it's worth. Granted, few properties creatively benefit from a studio being so intent on quickly strip-mining them, as Sony appears eager to do. For now, though, "Into the Spider-Verse" -- even with its excesses -- feels like one of the freshest spins on comic-book fare to swing into your friendly neighborhood cineplex. "Spider-Man: Into the Spider-Verse" premieres Dec. 14 in the U.S. It's rated PG.